Why we use Temperature Transmitter? - SILVER AUTOMATION INSTRUMENTS LTD.
To establish a temperature measurement system, electronic temperature instrument needs to be wired to control system . RTD and thermocouple can be directly connected to control system I/O card or through Temperature Transmitter for signal conversion. 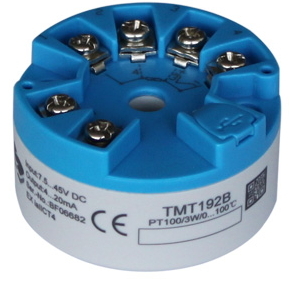 In most application, temperature transmitter is used to convert RTD/Thermocouple signal and transmit 4-20mA signal, rather than directly wired the RTD or themocouple to I/O card. The signals generated by Resistance Temperature Detector or Thermocouple are categorized as low-level signal hence it is more susceptible to noise compared to conventional 4-20mA signal generated by transmitter. Reduce instrument cable type. It also means less type for cable spare. The junction box for thermocouple temperature transmitter cables can be combined with those from other 4-20 mA transmitters. No need to provide special I/O card for thermocouple/RTD. Just connect the Transmitter to the Analog Input I/O card. Provided maintenance facilities such as diagnostic feature in smart transmitter.